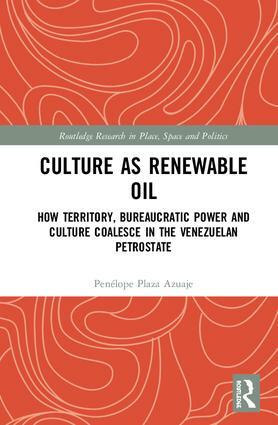 This book unpacks the links between oil energy, state power, urban space and culture, by looking at the Petro-Socialist Venezuelan oil state. It challenges the disciplinary compartmentalisation of the analysis of the material and cultural effects of oil to demonstrate that within the Petrostate, Territory, Bureaucratic Power and Culture become indivisible. To this end, it examines how oil is a cultural resource, in addition to a natural resource, implying therefore that struggles over culture implicate oil, and struggles over oil implicate culture. This book develops a story about Venezuela as an oil state and the way it deploys its policies to instrumentalise culture and urban space by examining the way Petro-Socialism manifests in space, how it is imagined in speeches and how it is discursively constructed in adverts. The discussion reveals how a particular culture is privileged by the Venezuela state-owned oil company and its social and cultural branch. The book explores to what effect the state-owned oil company constructs a parallel notion of culture that becomes inextricable from land, akin to a mineral deposit, and tightly controlled by the Petrostate. The book will appeal to researchers who are interested in Resource Management, Environmental Studies, Cultural Studies and Political Geography. Penélope Plaza Azuaje is a Venezuelan architect, researcher and urban artivist. She researches the entanglements between oil, politics, culture and urban space, with a particular interest in urban artivism, and contemporary Venezuelan petro-politics. She holds a PhD in Cultural Policy and Management from City University of London and an MPhil in Latin American Studies from the University of Cambridge. Currently she is a Lecturer in Architecture at the School of Architecture, University of Reading.